Your privacy is important to us. To better protect your privacy we are explaining our online information practices. Any information gathered by Do I Look Stupid? is used to customize Do I Look Stupid? and is not shared with or sold to any third parties. To prevent unauthorized access, plagiarism, maintain data accuracy and ensure the correct use of information, we have put in place appropriate physical, electronic, and managerial procedures to safeguard and secure the information we collect online. We believe in protecting your information just as we would want our information protected. In the event that any of the above mentioned information is compromised we would take the necessary steps to find a suitable solution as applicable by law. Do I Look Stupid? reserves the right to determine the form and means of providing notifications regarding the same to our users. Our services are not directed to people under the age of 13. 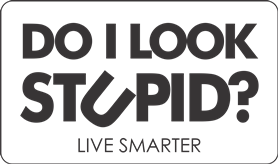 If you become aware that your child has provided us with personal information without your consent, please send an e-mail to us at doilookstupid99@gmail.com. We do not, knowingly, collect personal information from children under 13. If we become aware that a child under 13 has provided us with personal information, we take steps to remove such information and terminate the child’s account. To protect your privacy and security, we will also take reasonable steps to verify your identity before granting access to Do I Look Stupid? The main form of identity management is your e-mail address. Please always use a valid and up-to-date e-mail address. Should you have other questions or concerns about these privacy policies, please send us e-mail doilookstupid99@gmail.com.